At Live In Place, our passion is to assist our clients and their families in achieving their highest level of independence possible by improving mobility, comfort, and safety in their own homes. We have served thousands of families since 2007, and we are trusted and recommended by medical professionals in Northern Virginia and the Maryland/Washington D.C. metro area. From the beginning of our relationship with your family, we conduct a comprehensive, medically-based evaluation that covers specific home modification needs of your loved one. The founders established and designed Live In Place to offer complete home mobility and accessibility solution. They recognized a huge gap in serving the needs of seniors in the Northern Virginia/Washington D.C. metro area which, if filled, could enable them to live independently at home for the rest of their lives – no need to move to assisted living or a nursing home. But in order to live at home safely and effectively, the founders of Live In Place knew that modification services had to be approached in the right way. So, they drew upon their professional medical and therapeutic expertise and experience and designed a one-of-a-kind methodology that both clients and trusted senior advisors have relied upon with success for many years. Many of our clients have progressive illnesses or traumatic injuries. We work with every client and their families to quickly identify and understand their unique challenges and recommend solution options. We believe that expertise and education matter. This is why the team at Live In Place has extensive experience and industry-recognized certifications and licensing in Aging-in-Place, occupational therapy, home remodeling, and home services. 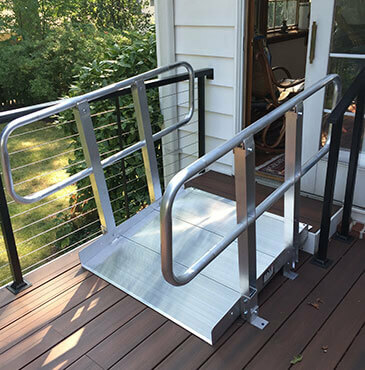 As a licensed Virginia home improvement contractor, Greg and his team are able to install home modifications such as stair lifts, ramps, grab bars, railings, bathroom safety solutions, and barrier-free designs. Greg listens to his clients and their family members, and he shares his knowledge and experience with them all as he assesses their needs. Each client presents a unique condition and set of needs accompanied by personal preferences, which Greg factors into his recommended solutions. He thoroughly explains the rationale behind the medically sound solutions, because he believes in educating clients about healthy body mechanics and lifestyle. Suzi is an occupational therapist and Certified Aging-in-Place Specialist, with 35 years of occupational therapy including 18 years as a home care therapist. Suzi carefully observes her clients’ conditions, needs, and abilities. She is passionate about designing and consulting on strategies that consider every aspect of a client’s needs (i.e., physical, cognitive, emotional, and spiritual). Suzi has an enthusiastic, can-do attitude that allows her to convey that there is a solution for every situation, tailoring her barrier-free designs to her clients’ abilities and desires. Her knowledge of anatomy, body mechanics, and disease progression leads to effective solutions that help to ensure safety, comfort, and appropriate energy usage. With her experience in daily problem-solving in her home care practice, Suzi provides credible design consulting and a wealth of time-tested strategies.